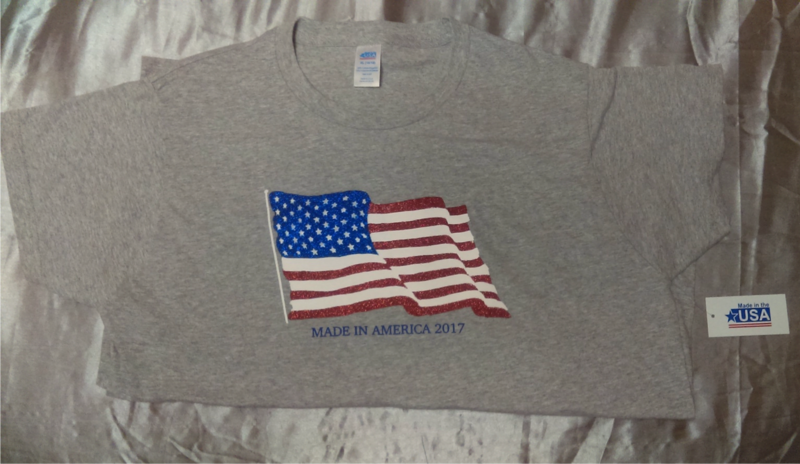 For many years, I have purchased a patriotic T-shirt to wear on the 4th of July. Many stores stock such shirts at very low prices as the 4th approaches. Often, the year appears on the shirts. I went shopping today for a 2017 shirt. My job was harder than usual. Given the present political climate, I was unwilling to wear a shirt that touted freedom or liberty. Wearing such a shirt wouldn’t seem sincere, given that we are led by an autocrat who is interested only in freedom from taxes for the rich and the liberty to die or go bankrupt for lack of medical care for everyone else. The shirt I finally bought is shown below. The flag is a bit flashy for my taste, but the legend “MADE IN AMERICA 2017” is relatively innocuous. And the shirt is, in fact, made in America.